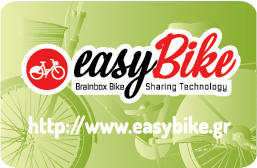 EasyBike system serves everyone! Aimed for all people who travel frequently or less frequently and looking for a healthy, alternative and economical mode of transport without being required to hold a bicycle. With the EasyBike system both the residents of the area and the visitors can move either by issuing a special electronic card (subscribers) or charge their credit card (occasional users). Permanent residents or frequent visitors can register as users by receiving a special electronic card that gives them access to the system while occasional users or guests gain access to the system by issuing a special access code using their credit card. The use of the card can be done in the rental stations, by mobile phone or over the Internet. Subscribers use a special electronic card to receive and return bicycles at the rental stations. Electronic bicycle card “contains” intangible usage time depending on the billing tariffs of the area. Upon successful registration in the system, the subscriber receives a bicycle from the rental stations simply by approaching the electronic card on it. Then, he uses the bike for as long as he wishes, and return it to any of the stations. The usage time is automatically calculated and subtracted from the card. When the available amount on the card is ending, the subscriber can update his time either on the Internet, either through automated telephone system or by visiting any of the authorised points in the area. In the same way he can renew and his annual subscription. Occasional users can either from their home via their mobile phone or via the Internet or by visit a rental station and with the use of their credit card through a secure banking environment, can buy usage time with a corresponding charge of their card credit. At the end of the period, the total time to cycle is automatically calculated and a corresponding charge is made. In case of theft and failure to return the bike on the specified time by the implementing agency (eg 24 hours), the system automatically charges the credit card with the amount defined as cost of the bicycle.